Browse our Ron’s Island Grill menu for various Hawaiian and Polynesian dishes – along with a few other classics everyone loves! Be sure to check out our side dish options and substitutions. Call in or stop by to grab your favorite dishes! Plates are served over rice with one side dish. Thinly sliced local free range beef marinated in house teriyaki. Chicken, beef (add $1), or tofu sauteed with green onions, mushrooms, sesame seeds, and garlic. Thinly sliced grilled teriyaki chicken. Chicken or tofu sauteed with fresh pineapple and vegetables in our spicy sweet and sour sauce. Chicken, beef (add $1), pork, or tofu sauteed with fresh vegetables and Ron’s teriyaki. Thinly sliced teriyaki chicken tossed in our spicy sweet and sour sauce. Huli chicken cooked in our tangy bourbon barbecue sauce. Huli Huli plus choice of one other plate, #1-7 or #10 (beef, add $1). Red curry peanut sauce sauteed with vegetables and chicken, chicken katsu, or tofu. Natural, local pork, slow cooked until tender. Chicken, chicken katsu, or tofu sauteed with fresh vegetables in a sweet and spicy curry. Crispy chicken breast, red bell peppers, green onions, and fresh pineapple in our spicy sweet and sour sauce. Traditional fried rice stir-fried with Kim Chi and choice of huli chicken, pork, spam or tofu. Fried rice with choice of tofu, chicken, or pork. 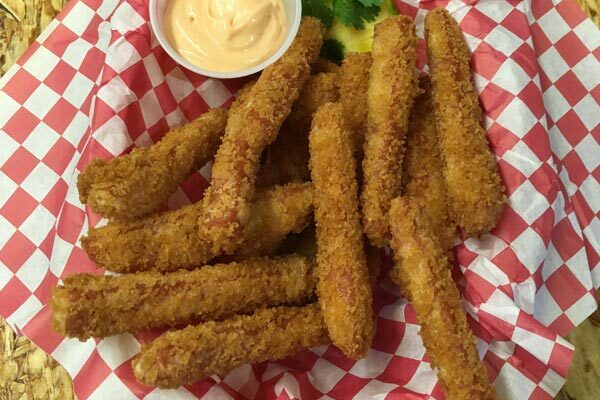 Panko breaded Spam Fries. Crispy and delicious! Your choice of pulled pork or fried spam. Served on a hoagie bun with pineapple spread and a side of coleslaw & fries. Hand-breaded cod, deep fried and served with fries and coleslaw. Chicken, beef, pork, or tofu stir fried with vegetables in a traditional yakisoba sauce. Huli chicken, romaine, carrots, red bell peppers, mushrooms, green onions, fresh pineapple chunks, and creamy ranch dressing.